Public support for Donald Trump’s decision to launch airstrikes against the Syrian regime is low compared to support for previous foreign actions, according to the latest Gallup poll. Polling data reveals that just 50 percent of Americans approve of airstrikes against the Assad regime, while 41 percent disapprove, while 10 percent have no opinion. This figure is historically low compared to other military interventions, such as in Afghanistan in 2001, which had 90 percent approval rating compared to just 5 percent disapproval. George. W. Bush’s decision in 2003 to go to war with Iraq also had 76 percent approval at its inception, and 20 percent disapproval. The only military action in recent years with less public support was Barack Obama’s intervention in Libya, which had 47 percent approval and 37 percent disapproval. Meanwhile, current military action against the Islamic State in both Syria and Iraq has far greater supporter than that against the Syrian regime, with 60 percent approval and 31 percent disapproval. Meanwhile, figures such as House Speaker Paul Ryan, Senate Minority Leader Chuck Schumer, and House Minority Leader Nancy Pelosi all praised the strikes, calling them as an effective deterrent against further chemical weapons attacks. The attacks have also heightened tensions with Russia and Iran, who are still providing military assistance to the Assad regime. 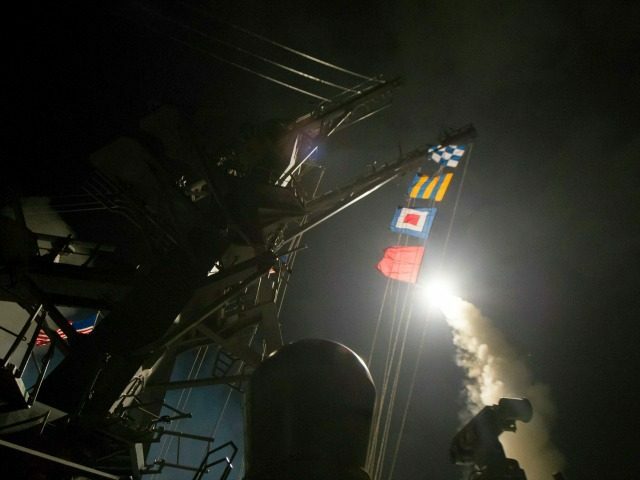 On Tuesday, both countries warned the U.S. that they will “respond with force” if they believe their own “red lines” are crossed in Syria. Furthermore, Furthermore, Russian officials have confirmed that Vladimir Putin will not be meeting Secretary of State Rex Tillerson when he visits Moscow later this week, despite Putin awarding Tillerson a Russian Order of Friendship award in 2013.